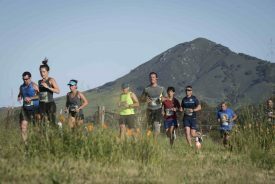 SAN LUIS OBISPO, Calif. – (Feb 11, 2019) – Our region’s largest community fitness festival, produced by the Central Coast’s endurance sport leader Race SLO, is slated for the weekend of April 26 – 28 at the Madonna Meadows in San Luis Obispo. Runners, walkers and fit fans of all ages and levels are welcome to join one of the six weekend events. New to the expanding line up this year is the inaugural YogaMusic Fest Friday night and Sunday Corporate Relay Team Half Marathon Challenge. Also new this year will be on-site childcare provided by Race Rugrats.